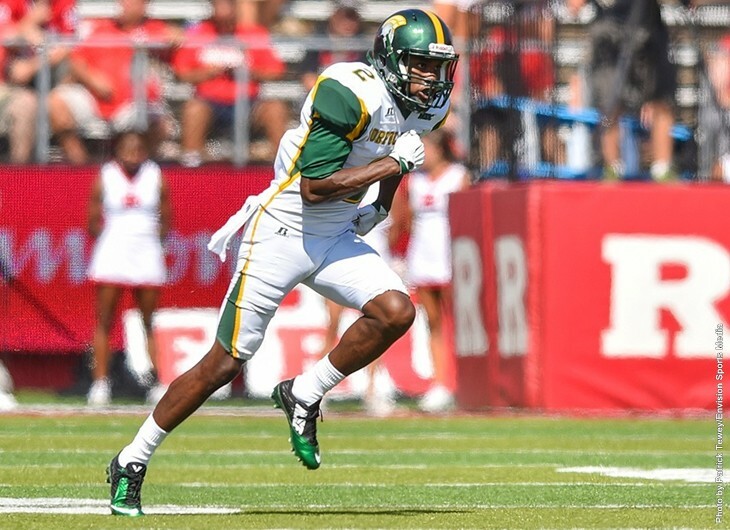 NORFOLK, Va. – Ray Lawry rushed for 215 yards and two touchdowns to help Old Dominion hold off Norfolk State by a 24-10 score in a matchup of Norfolk’s two collegiate football programs on Saturday night at S.B. Ballard Stadium. The game – the third all-time between the teams – was delayed twice due to thunderstorms. The second included a delay of 1 hour, 12 minutes during halftime. Trailing 14-10 at that stage, Norfolk State (0-2) threatened several times in the second half, but was turned back each time by the Monarchs (2-0). NSU quarterback Greg Hankerson Jr. passed for 163 yards and ran for a team-high 74 to lead the Spartans. Syracuse transfer receiver Quinta Funderburk had the best game of his collegiate career, tallying six receptions for 92 yards. After a storm delayed the game’s start by 15 minutes, ODU took the opening kickoff and marched 72 yards in nine plays – all on the ground – to take the early lead. Lawry scored on a 4-yard touchdown run to give the Monarchs a 7-0 edge with 11:11 left in the first quarter. NSU got on the board early in the second quarter, as Cameron Marouf kicked a 27-yard field goal to finish off a 15-play, 70-yard drive nine seconds into the period. ODU drove to midfield on its next possession, but the Spartans’ special teams came up with a momentum-changing play. Freshman defensive lineman Hadji Gaylord blocked Jarrett Cervi’s punt, scooped up the loose ball and returned it 32 yards for a touchdown, giving NSU a 10-7 advantage with 13:24 left in the half. The Monarchs retook the lead just before the half as Lawry’s plowed in from the 1 on a 4th-and-goal play with 2:44 left before halftime. Lawry’s second TD run of the day capped a 16-play, 80-yard drive and was ODU’s second fourth-down conversion on the possession. The Spartans had two prime opportunities to retake the lead in the third quarter. NSU took the opening kickoff and drove to the Monarchs’ 34, but Hankerson’s fourth-down pass to Gerard Johnson was short of the first-down sticks. NSU got the ball back quickly when Donte’ Haynesworth intercepted a pass by Shuler Bentley at the ODU 41. But the Spartans were again stopped short on fourth down, this time from the ODU 36. Following that turnover on downs, the Monarchs drove 64 yards to go up 21-10. Kesean Strong scored on a 2-yard run to put ODU up by two scores with 3:30 left in the third quarter. Ricky Segers’ 25-yard field goal extended the lead to 24-10 with 7:01 left in the fourth quarter. NSU appeared poised to get right back into it. Johnson rushed for 11 yards, Hankerson hit Markice Street for a 10-yard pass play, then Hankerson found Funderburk on a 51-yard gain. Funderburk was pushed out of bounds at the ODU 2, but the Spartans fumbled on the next play and ODU ran out the clock. Johnson added four receptions and James Church Jr. had three for a career-high 52 yards for NSU. Defensively, linebacker Deon King had a career-high 21 tackles. Safeties Leroy Parker (12) and Brandon Walker (10) also had career highs in tackles. Cornerback D’Metrius Williams deflected a pair of passes and Haynesworth notched his first career interception. The Spartans finish their three-game FBS road swing to start the season next Saturday, when they face Marshall at 3:30 p.m. in Huntington, W.Va. Tags: football, Monarchs, Norfolk State, norfolk state university football, Norfolk State University, NSU, ODU, Old Dominion, Old dominion university, Spartans. Bookmark the permalink.